Our first commission with him was the Teen Gohan with purple background. It was essentially a test of how quickly he’d respond, get work completed, and just testing him. I can say with confidence we’re glad we tried him out! He was able to work on it rather quickly, communication was clear and fast, and we loved the artwork! He has very reasonable prices for commissions too. After working with him with the Gohan commission, we wanted to test how well he’d draw more detailed artwork. So we put him to the test with the Hairy Goku idea. He accepted the idea and got to work. He kept me updated on the process and sent the sketch as normal before moving to coloring. You can see below the different views for Hairy Goku. We wanted these commissions as well for the front page of our site. We had the idea of doing character buttons, but didn’t want to use artwork that wasn’t ours, so all of this worked out perfectly! He handled the process like a champ as before. Got the artwork and love it! Comic idea – Coming soon! Already fallen in love with Kenneth-00; we wanted to discuss an idea we’ve had with other artists but couldn’t invest money in the idea just yet. We talked it over and was able to find a way to work it out! We are turning one of our stories into a comic for you guys to enjoy! We’re super excited about this too! You can see the official cover for the comic below, along with the commissions mentioned above! Make sure to rate this, and leave a comment below!! 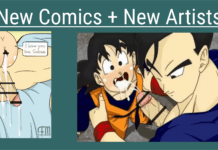 Join the DBZ Gay Content Sub-Reddit!